Roy Scheider is afraid of the water. He has been his whole life. It’s a difficult one to explain, especially considering the life he’s chosen: chief of police for a beach community on a small island in New England. Early on in 1975’s Jaws, someone asks him what he was thinking, coming to an island when he’s terrified of water. His answer is clever, but it would be foolish to take it as a joke. “It’s only an island if you’re looking at it from the water.” His whole life, he has listened to people tell him that this fear is irrational, that there’s nothing to be afraid of. But now, his time has finally come. Finally, people will see that he was right to be afraid, right all along. They were the ones behaving irrationally. There is something in the water. Not just a shark. Not just a fish. Not just a monster. It is a danger so complete, a threat so insurmountable that only he can see it for what it is. His fear made real. 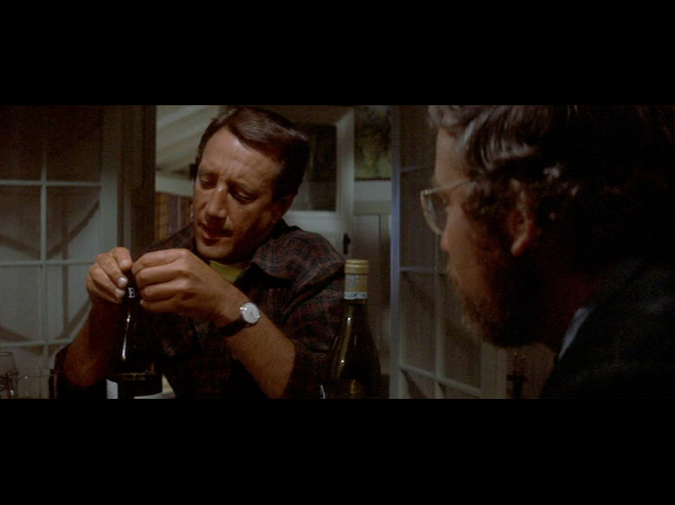 Early in the film, Matt Hooper, a marine biologist played by Richard Dreyfuss, shows up at the Brodies’ house for dinner, a bottle of wine in each hand. After the meal, after the kids are put to bed, the three adults begin to talk, leaning over plates of bones and crumpled napkins at the dining room table. Ellen Brody teases Hooper about his interest in sharks, which gets him going on an anecdote about the shark who ate his childhood boat. He swam for his life, watched the wreck sink from the shore. As the two of them speak, Brody is quiet. He sits at the head of the table as Hooper and Ellen talk across him. He dominates the shot, the other two pushed so far to the sides of the frame that they’d likely be cut out completely in a pan-and-scan edit of the movie. He reaches for one of the bottles of wine, as yet unopened. As the others laugh and flirt, Brody takes the wine key and begins slicing at the foil on the bottle. He is silent, only occasionally looking up at Hooper’s face or his wife’s. Let’s talk about my heart. It beats, on average, eighty-two times a minute. This is on the high side, and I am well aware of this fact. This awareness is the problem. If I sit completely still, I will think about my heart until I can feel it, every beat of it, in the center of my chest. As I type this, it is starting to happen. Just thinking about my heart. Reading the word heart. Seeing a picture of one. Watching a movie with a hospital scene. Touching myself momentarily on the sternum. Strapping a seatbelt too tight around my chest. Any of these are enough to set off a chain reaction, a biochemical sequence entirely outside of my control. And that’s if I’m lucky. Just as easily, it can be set off by absolutely nothing. I may be sitting in a work meeting, or staring out the window of a bus, and something will begin to move inside of me. My pectoral muscle begins to twitch and contract involuntarily—a kind of nervous tick, a defense posture, my body bracing itself for the full cardiac episode I’m convinced is coming. If I’m not able to distract myself long enough, or find some way to break the cycle, my chest will begin to hurt. The pain will spread down my shoulders. My arms will feel numb. I will feel lightheaded. A strange tingling sensation will move through my fingertips. Inside my stomach, something is tightening, winding itself more taut by the second. There is no mistaking it. I am going to die. Medically, there is nothing actually wrong with me. Well, that’s not quite right. There is nothing wrong with my heart. The problem, in a way, is evolution. Anxiety is a kind of short circuit of the fight or flight response. Evolution has done amazing things with your body. When you see a predator approaching you from the tall grass, your heart begins to pump faster; your breaths become frantic, shallow. Your blood needs more oxygen so that you can move quicker, run farther. At the same time, blood drains from your extremities. This is helpful. Should the predator manage to bite off a finger or a toe, a hand or a foot, there will be less blood loss, an increased possibility of survival. The synapses in your brain are firing more rapidly. Time slows. You are able to weigh every possible outcome as you jump a log and climb a tree, make judgments and measure the consequences of each decision, each gap in the undergrowth, each possible escape. That pit in your stomach, that urgency? It is the fire in the center of you, refusing to go out. The scene is such a classic that I am hesitant to even describe it. Down in the bowels of the Orca, the modest vessel captained by Robert Shaw’s irascible Quint, three men compare scars. Hooper rolls up his sleeve—a dark gash where a moray eel bit through his wetsuit. Quint pounds his leg onto the table—the mark of a thresher shark’s tail tearing across his shin. Quint and Hooper swill cheap moonshine out of Bakelite coffee cups, drinking to each others’ battered bodies. Finally, Brody points out a scar he’s been eyeing on Quint’s left arm. A tattoo, since removed, that Quint is loathe to elaborate on. But he does. He turns inward, all his bluster and crankiness and eccentricity dissolving, disappearing inside of himself as he tells the story of being shipwrecked in the Second World War, left for dead, watching his comrades devoured by sharks as he waited to die. Soon, the emotional moment will devolve into the three men singing a drunken sea shanty, a moment of camaraderie before it all goes to hell. Before long, the shark will destroy the boat and drag Quint screaming into the bloody foam. But first, we have to watch Brody for just a moment longer. We need to watch him just a little more closely. As Quint and Hooper trade battle scars, the landlubber mostly watches, listens, occasionally smiles. He plays nervously with a length of rope—practicing the knots for the rigging that he keeps botching on deck, much to Quint’s irritation. He doesn’t offer his own scars. He has a cut on his head, but it will likely heal. As Quint says, “It’s not permanent.” At one point, he lifts up his shirt, looks down at his stomach, as if he’s found a wound profound enough to share. But he doesn’t speak. He pushes his shirt back down. This isn’t him. He isn’t like these men. He doesn’t want to be here. He wants to be back on land. He wants to be safe. He wants, for once in his life, to stop being afraid. I don’t think I have many scars of my own until I begin to list them. A pale gash at the base of my left thumb, surrounded by a constellation of white dots—surgical scars from the pins inserted into my hand after I broke it in a car accident at eighteen. For years afterwards I would panic anytime I entered a car, would tense up and brace for impact with every left turn against traffic. A pale mark hiding beneath my pubic hair—a hernia operation the previous summer. Convinced the swelling beneath my scrotum was an inoperable tumor, I’d hidden it for years, until a doctor found it during a routine physical. A cloudy spot on the surface of my left eye that permanently impairs my vision—scar tissue from a virulent bacterial infection that tore ulcers into my corneas for years. The infection was exacerbated by my reluctance to seek treatment. My fear proved too much for me—fear of doctors, and worse, fear of paying the doctor’s bills during an extended period of being underinsured and completely broke. A history written in flesh, a history of fear, fear of each of the many ways my body could fail me. On January 5th of this year I sit alone in my home office trying to breathe. Breathe in. Breathe out. Breathe in. Breathe out. Nothing is happening. You are healthy. Maybe nothing is happening. Maybe you are healthy. But maybe you are not. Maybe you are dying, right now, as you speak. That tightness in your chest—every website you have read insists that it is your heart collapsing inside of you. That tingling in the arms? The life running out of your limbs. The dizziness? A sign that you are about to lose consciousness for the last time. Those shallow breaths? Your last. You have a choice in this moment: you can call an ambulance, you can ask for help, or you can be gone in an instant, surrendered to blackness. Your hands shake as you make the call. Your voice quavers as you say the words. They sound false, as if you’re reading them from a script. You are not in your body right now, in this moment. No, that’s not it. You are nothing but your body. Anything you have thought or felt, anything that makes you who you are, it is swimming deep inside of you, too small to be noticed, flailing too desperately not to be devoured. Brody is okay. At least, he’s alive. He blows the shark up, even gets a chance to utter an iconic action hero kill line in the process. He and Hooper paddle back to shore, clinging to a piece of debris from the boat. It’s the beginning, we assume, of a beautiful friendship. Brody, if the Hollywood story structure is to be trusted, shouldn’t be afraid of the water anymore. This harrowing experience, this crucible of water and blood, should have cured him. But I don’t believe it. Even if I didn’t have a handful of sequels to bear out my argument, I know better. Real fear can’t be destroyed. Not really. We can keep it at bay. We can lessen its sting. But it will always be there, just beyond our reach, creeping up on us when we least expect it. By the time I get to the hospital, I cannot believe I am there. It becomes clear very quickly what is happening. The moment the paramedics burst through my front door, I feel better. I feel safe and warm. Sitting in the ambulance, wires glued to my chest, tubes protruding from my arm, I feel incredibly stupid. Sitting next to my wife in the waiting room, I apologize profusely. How ridiculous I feel. How obvious it seems to me in that moment—what is real and what is an illusion. What is me and what is sickness. But here’s the difficulty. Dozens of therapy sessions and hundreds of milligrams of mood altering drugs later, it can still happen. I know, thousands of dollars in medical bills providing the closest thing 21st Century America has to certainty, that there is nothing wrong with my body, nothing wrong with my heart. But if I sit here long enough, if I read the wrong words, if I see the wrong scene in the wrong movie, if I think the wrong thought, I am back there. I am trying to swim but the water is too deep. Teeth flash white in the darkness. My heart beats faster. My head feels light. There is nowhere to run.